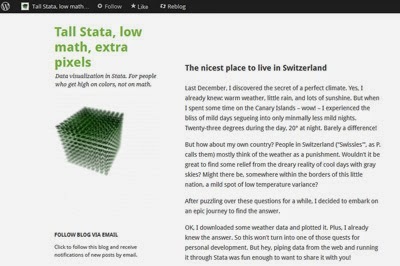 With a clever titled blog and in well written in-depth initial post, Alex Gamma at the University of Zurich, Switzerland enters the Stata blogging scene. Check out his post on "The nicest place to live in Switzerland" at Tallstata.wordpress.com. Dave Giles on "MCMC for Econometrics Students"
Shout out to "R Handles Big Data"
RStata: Funny or just annoying? Does R have too many packages?